Matthew Flinders was born in 1774 in Donington, England. In 1789 he entered the Royal Navy and two years later he served at sea under William Bligh until 1795. Then as a self-educated navigator, he sailed to New South Wales in to explore the waters between Australia and Van Dieman's Land (Tasmania). The circumnavigation and the identification of Van Diemen’s land as an island was accomplished in 1798-1799. The strait between Australia and Tasmania was named for George Bass (1771-c. 1803), now known as the Bass Strait. He sailed to England and in 1801 returned to Australia. In 1801 Flinders commanded an expedition to explore the coastline of Australia, during which he passed through the great barrier reef and surveyed the Gulf of Carpentaria. In 1803 he circumnavigated Australia. His charts were very precise and remarkably accurate. After his work, in 1803 he sailed for England but unfortunately, his ship was wrecked at an uncharted reef and he returned to Australia in the ship's cutter. On his homeward journey, Flinders was imprisoned by the French for almost seven years in Mauritius as a spy. When he was released in 1810, he returned to England and wrote a book A Voyage to Terras Australis which was published in 1814. On the same day it was published, he died. The stamp pair shows a map of Australia, Van Diemen’s Land and the Bass Strait. 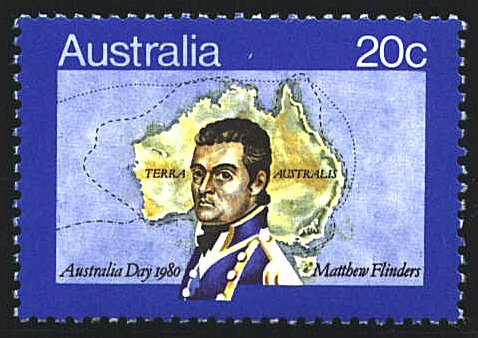 The stamp was issued in in 1980 to commemorate Matthew Flinders’ explorations of Australia. The map is based on Flinders’ chart of Terra Australis. Flinders' charts were engraved by Arrowsmith and published with his Voyage to Terra Australis. They "were updated at the direction of the Admiralty to include results of exploration made by others during the period of Flinders' imprisonment on Mauritius from 1803 to 1810…. Other sources for the General chart include Cook's charts of part of north Queensland's coast and Dalrymple's versions of Dutch charts of the west coast. The General chart shows the track of the Francis around Van Diemen's Land in 1798, and Investigator, Porpoise, and Cumberland 1801 to 1803.